At some stage in their youth, most pianists have tackled warhorses (both robust and delicate) in the repertoire, whether they are by famous composers – the Prelude in C sharp minor (1892) by Rachmaninoff or Clair de lune (1890/1905) by Debussy – or by someone more obscure, such as Frühlingsrauschen (Rustle of Spring, 1896) by Sinding. Earlier examples included the Melody in F (1852) by Anton Rubinstein and Menuet in G (1887) by Paderewski. In amongst these pieces is a Polish Dance (1869) by Franz Xaver Scharwenka (1850–1924), who was born in the Prussian zone of partitioned Poland. This mazurka, a reflective example of the genre, became his calling card as both composer and pianist. His career as an international performer has largely receded from memory, although a few recordings do survive, and his considerable achievements as a teacher and founder of conservatories in America and Germany have passed into history. His output as a composer was not large – an opera, a symphony, chamber music, and works for solo piano – although his principal opus numbers run into the eighties. 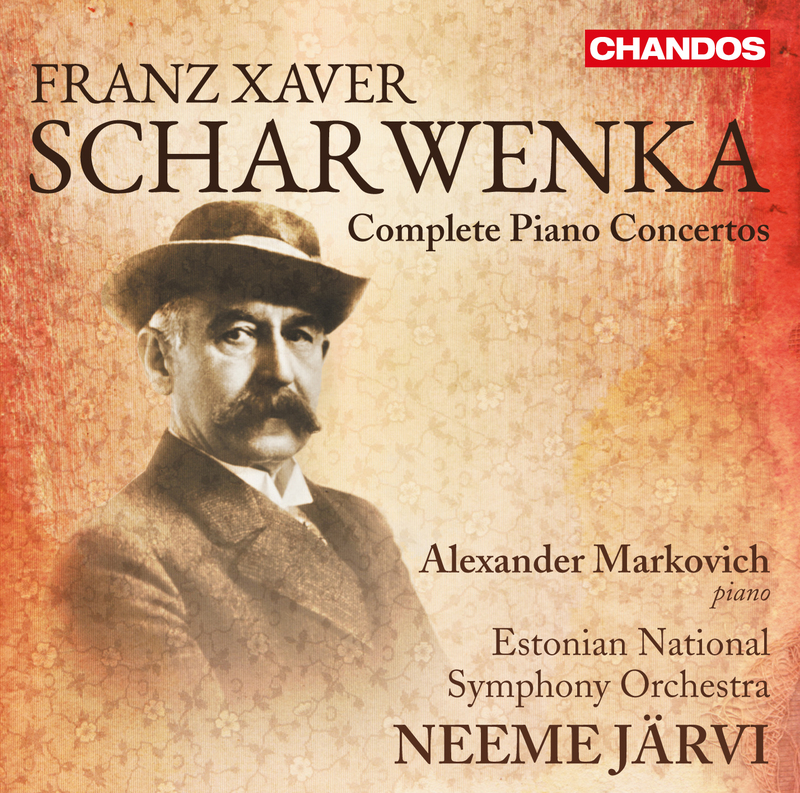 Scharwenka was, nevertheless, a much lauded and beloved figure during his lifetime, and central to his profile were the four piano concertos that spanned over thirty years of his career. These faded somewhat from view after his death, but in the last decades of the twentieth century interest in them revived and, while they are not prominent on the concert platform, they have received a number of recordings in recent years. This double-CD brings all four together for the first time. The First Piano Concerto in B flat minor (1876) brought Scharwenka great renown. It is dedicated to Liszt, for whom Scharwenka performed it privately. The gestation of the work was not simple. It began life as a two-movement Fantasy for solo piano and Scharwenka worked on it for several years from the early 1870s before it reached its final shape. In three movements, the result is a seemingly conventional structure, yet the content reflects its origins as a solo fantasia. The stirring opening tutti is cut short by the piano, which wrests the spotlight from the orchestra, and so it remains. What then emerges, rather than a contest, is a constantly evolving elaboration not only on the initial theme but also on more lyrical and introverted ideas, interspersed with moments of bravura. This became a feature of later concertos too. Of particular note is the wistful tone of the Adagio section, introduced by strings, the melody given to the violas. As much of the first movement is in reflective mood, it is not surprising that Scharwenka replaces the traditional slow movement with a Scherzo. Its main theme cross-fertilises the triple metre with duple phrasing and the second theme has a simple but beguiling tripping rhythm. The movement shows the strong influence of the style brillant, recalling composers such as Hummel and Chopin, while elsewhere in the concerto parallels may be drawn with Liszt and Grieg. It is in the finale that the elements of the fantasia are most pronounced: a mysterious, expectant orchestral opening, a solo peroration ending with a brief allusion to the viola theme from the first movement, echoed by the clarinet. Only then is the movement fully launched, yet it becomes entranced by the recalled theme. Liszt’s cyclic principles are tempered by Scharwenka’s quasi-improvisational approach, which at last gives the soloist a designated Cadenza, marked Maestoso, which also reintroduces the work’s opening theme. A compelling coda ensues. When he returned to the genre in 1881, with the Second Piano Concerto in C minor, Scharwenka seemed stylistically to be taking a step back. The concerto has less rhetorical and lyrical sweep than its predecessor and more of a conservative hue. The figure of Brahms looms large, not only in the scale of the first movement – at almost twenty minutes, it constitutes half of the concerto – but also in the greater muscularity of the solo part and the more conventional interchanges between soloist and orchestra. The piano writing is more challenging too, made weightier by the doubling of its lines in sixths, another Brahmsian trait. Yet Chopin is never far away. After the muted strings have opened the central Adagio, the piano embarks on a Chopinesque nocturne, marked dolce. Its tranquillity, despite occasional forthright moments, is a perfect foil not only for the grandness of the opening Allegro but also for the sparkling folk dance that infuses the finale. This movement may draw comparison with the finale of Brahms’s Second Piano Concerto, also completed in 1881, but here the 2/4 metre evidently looks towards Scharwenka’s native Poland. Although the finale lacks the prominent characteristic of the krakowiak – a syncopated emphasis on the second note – the rising melodic line and ornamental turns and trills are very much a part of that duple-metre Polish dance. The vivacious main idea is interspersed with quieter moments, and towards the end Scharwenka softens the folk rhythms with triplets. As the music in the closing stages heads through tonal peregrinations that are startling even for him, Scharwenka cannot resist a brief backward glance, in the major key, to the concerto’s opening idea. All of Scharwenka’s concertos are in minor keys. The Third Piano Concerto, which followed the Second in 1889, after a substantial gap, is in the least common key of the four, C sharp minor. The opening Maestoso might be said to reflect this tonality (did Scharwenka perhaps have Rachmaninoff ’s Prelude in mind?) and its stentorian tone is mightily impressive. Yet the theme is cast as a mazurka in all but name, though with the Polish dance element completely removed. Scharwenka is now in a high-romantic mood, alternating strong passages with delicate and lyrical ones. The last of these, a winsome melody introduced by flutes and clarinets, answered by the piano, and given full form by violins and cellos in octaves, molto espressivo, also features in the central piano Cadenza. The second movement, another Adagio, opens with a cantabile melody in the strings, and the piano’s response indicates that Chopin has been left behind in favour of something more full-bodied. For its second major entry, the piano revisits the winsome theme from the first movement, before joining with the orchestra in developing the main idea. But the music of the first movement cannot be restrained. Not only does the now less-than-winsome theme reappear, but the opening theme of the concerto comes to the fore: Liszt’s cyclic thematicism is back. Without a break – the music presses forward like a through-composed song – the finale emerges, the opening theme of the first movement recast anew as a mazurka (French horn), but this time more evidently so. What starts as a dainty dance soon receives fuller treatment by the piano, but at heart the movement is a lyrical outpouring rather than a rumbustious dance. A second major episode for the solo piano (neither of them is called a cadenza) recalls the first. The closing bars come full circle to the concerto’s opening material and tone. His Fourth Piano Concerto in F minor (1908) was rapturously received and honours were showered upon Scharwenka. The concerto was dedicated to Queen Elisabeth of Romania. The first movement is headed Allegro patetico, recalling Tchaikovsky’s use of ‘pathétique’ for the Sixth Symphony. The initial motif does not immediately seem capable of great significance, yet it underpins the whole concerto, either in its original state or developed. The grandness of the orchestral and solo writing in the opening minutes is suddenly abandoned for a looser, quasi-recitative sequence of ideas that would not have been out of place in the First Concerto. In current parlance, this movement is a ‘roller-coaster’, broadly structured and unafraid to move rapidly from one expressive world to another. The second movement is a surprise, an Intermezzo – Allegretto molto tranquillo – that borders on eighteenth-century pastiche, at least at first. There is a turbulent section further on, but the most surprising aspect is the recurrence of both main themes of the opening movement, without much sense of integration. Such connectivity is symptomatic of the overwhelming cyclic concerns of the work. It becomes evident in what follows, the Lento, mesto with which the finale begins. The themes of this section, too, are taken from the first movement, but such is the scale of their elaboration that the ‘introduction’ might easily stand as a discrete slow movement, making this a concerto in four movements. The return of the main motto idea on bassoons (very Tchaikovskian), then on French horns, leads into the Allegro con fuoco, a dizzying and technically demanding tarantella in 12/8. Its first subject is elusively syncopated, its second more straightforward and introduced in the tonic major. Once again, themes from earlier in the work are integral, and the concerto ends in a fierce whirl, as all good tarantellas do.